The only knitting happening here is being accomplished with DPNs. I am obsessed with small projects that are knit in the round. Every pair of DPNs I own under 3.25 mm have something on the go. I'm guessing that this is the result of the more of less nomadic lifestyle that's been following me and the recent change from fall to winter temperatures. I never actually summed up my total count for UFOctober. Suffice to say that I didn't reach my goals and that, a month later, I am still working towards finishing up a couple of them. These socks fit well once you finally get them on but mine are quite the struggle to pull on and off. The coriolis band really affects the stretch of the fabric and it requires a lot of maneuvering to pull it on over my heel. If you decide to give these lovelies a try I would suggest trying them on regularly to minimize disappointment. In keeping with the unbridled startitis that has taken my stash and swift by storm (more on that later). I've already got my next socks from Cat's book picked out. I've even gopher-ed the perfect skein of self-striping yarn from the stash and wound into a tasty tasty yarn cake. The only thing keeping me from casting on is my lack of available sock needles. 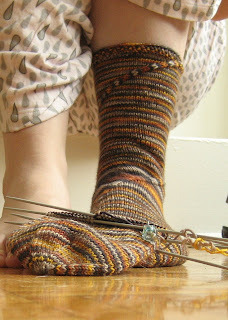 Although I refuse to facilitate the insanity by buying yet another set of needles, I have considered frogging other socks in progress just to steal the needles. It's crazy, I know. To compensate, I've cast on for not two but four new projects...none of which are my obligatory gift knitting. To minimize the shock (mine not yours), I'm only introducing two of the new kids today. 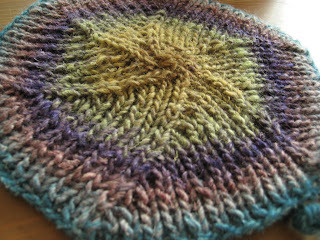 First up is Norah Gaughan's, creator of the Sand Dollar Pullover, Spiral Scarf in Noro Silk Garden. This is the first and largest of 12 hexagons that will eventually turn into a finished scarf. And then there was the knee-jerk reaction to my freezing cold office: Eunny Jang's Endpaper Mitts, knit with Sweet Georgia's amazing Superwash Sock yarn. I love these colours, even if they are similar to the ones Eunny originally chose. 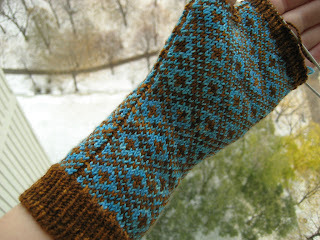 The first mitt is finished aside from the tubular bind-off that I have to re-try when I have a few moments in front of my computer. The last new thing I want to mention today is the newly implemented Trim the Stash initiative here in the knitter household for the coming months. I've decided that I need to cut back on the amount of yarn that follows me home from the LYS. I love every single skein that I own and I'm tired of feeling overwhelmed with beautiful yarn that wants to become beautiful things. I'm not interested in resolving not to buy anymore yarn for a certain period of time. Yarn and fiber inspire me and digging through the bins at my LYS is part of what I love about the process of bringing a project to life. Since I refuse to give up buying any new yarn I'm hoping to acquire less yarn than I knit up. I've gone through and cataloged all of the yarn in my stash (you can check out most of it on Ravelry if you're interested) and I'm instituting a chequebook system for stash management. Over the next year, I hope to cut the stash down by about 12%. If I knit about four balls of yarn less than I buy every month I shouldn't have any problem reaching that total. In the interest of accountability, I have posted a current tally of my stash in the sidebar. I'm starting with 411 balls of yarn coming in at a whopping 92,953 yards and 28,977 grams of yarn (a.k.a 63 pounds). I'll update the totals whenever I use or acquire new yarny friends and you can feel free to heckle me when the numbers start getting out of hand. Spinning content is forthcoming...as soon as I can find my camera, my wheel and some natural light in the same place at the same time. 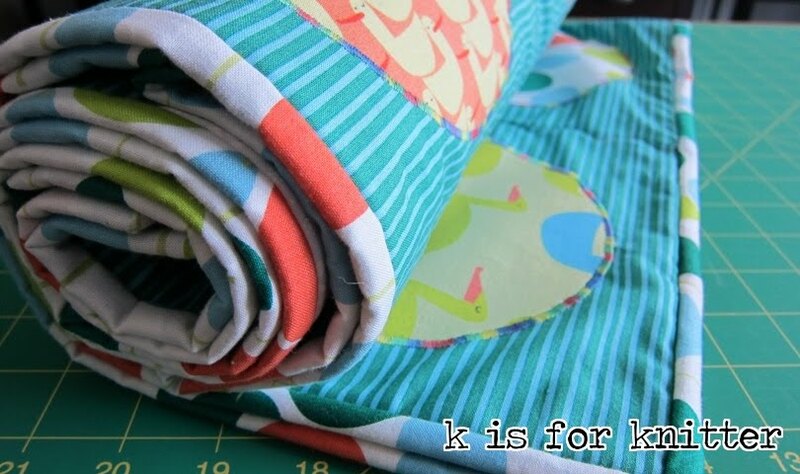 Posted by Amanda at 1:36 p.m.
Love those end paper mitts. I am not clever enough to make them, but it is so nice to see others work them up - well done! I also like the idea of stash accountability. A good but frightening idea :) I dread to think what I have stashed! November 28, 2007 at 6:42 p.m.